This issue’s cover illustration by John Kelly is from Terry Deary’s new series Master Crook’s Crime Academy: Burglary for Beginners. Terry Deary is interviewed by Elizabeth Hammill. Thanks to Scholastic Children’s Books for their help with this March cover. Come August, Graham Oakley will have his eightieth birthday and this new edition of his most celebrated book makes a handsome present for him. 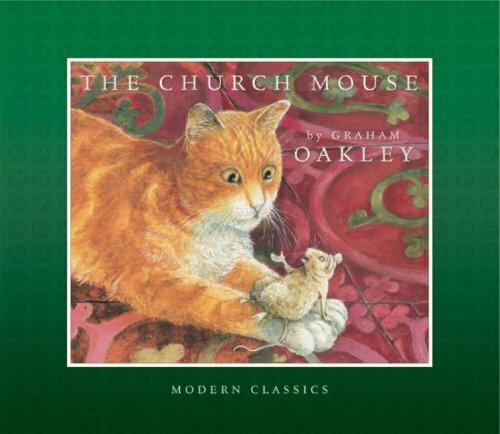 The story should be almost universally known by now of how the mice of Wortlethorpe, in collaboration with the church cat, Samson, obtain gainful employment from the vicar as factota on the premises and, after a calamity that merits their expulsion, redeem themselves by catching a burglar. The story wends its way amongst spreads and panels of pictures, rich in detail of the many participating characters and of local circumstances, whether so small as a mousetrap: ‘The Nipper. Regd. Trade Mark’ (‘Look at that thing,’ say some resident mice, ‘people leave them lying about and they can be dangerous’) or so varied as sundry inscriptions on books, tombs, and commercial paraphernalia. The new edition, carefully printed and nicely bound, also carries an afterword noting the book’s first publication in 1972 as the start of a series that was to feature the buildings of Wortlebury. But its kindly reception led instead to no fewer than thirteen successors all about the activities of the mice themselves. Shall we be seeing some more of those, I wonder?